Please remember that fire extinguisher maintenance is important for everyone’s safety. Fire extinguishers successfully extinguish 82% of all fires in the UK. 10% of all fires in the West of Scotland are commercial fires. 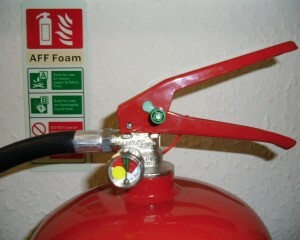 Fire extinguishers are your first line of defence so require a little simple maintenance by you on a regular basis. The safety pin and anti tamper seal are intact. The cylinder pressure is at the required level. On the gauge the needle should be in the green area. The extinguisher instructions are legible and not defaced in any way. The hose or nozzle are in good condition. There are no dents, leaks, rust, chemical deposits and / or other signs of abuse / wear. Wipe off any spillages that are on the extinguisher with warm soapy water and dry off. Ensure that the extinguisher is stowed off the floor on its hanging bracket. Ensure that the correct extinguisher I.D. sign is on the wall above the extinguisher. If the extinguisher is damaged or needs recharging call us immediately. If you have any questions at all then please do not hesitate to call us for advice about your fire extinguishers on 0141 561 2735 or book a free no obligation fire extinguisher workplace survey. Thanks for blogging with us and if you have any questions then please get in touch or comment on the page. This entry was posted in Guidance and Advice and tagged extinguisher, Fire, maintenance, paisley, types. Bookmark the permalink.